Turkish Foreign Ministry said on Saturday that Turkey's jets have carried out their first airstrikes as part of the U.S.-led coalition against ISIS in Syria. The Ministry's statement said the jets began attacking ISIS targets late Friday across the border in Syria, deemed to be threats to Turkey. The statement read, "The struggle with the terror groups is Turkey's priority in terms of national security. This struggle will continue with determination." The private news channel NTV reported that Turkish jets struck seven ISIS targets in northern Aleppo in Syria, whereas Doğan news agency said two jets carried out strikes on four ISIS targets on Saturday. The statement gave no further detail of the strikes, launched under the operational name Authentic Resolution. Pentagon official Navy Capt. Jeff Davis had told reporters on Thursday that American and Turkish military experts have put the final touches on an agreement signed earlier this week and Turkish jets will soon fly alongside U.S.-led coalition aircrafts in the fight against the ISIS terrorist organization. 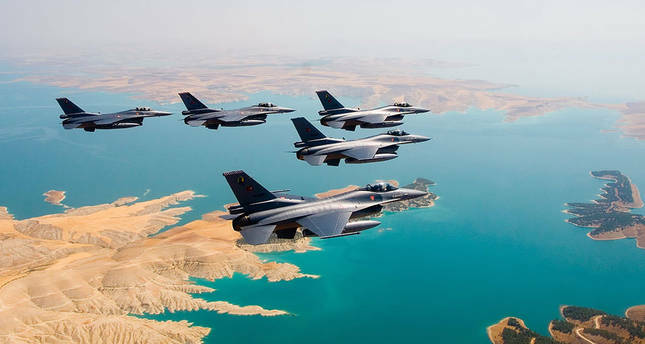 "I am not going to give you days and hours but very soon," he had said, noting that Turkey's participation would give the coalition the ability to fly more missions within the air campaign against the militant group. The Turkish Foreign Ministry had also Thursday confirmed the U.S. and Turkey's join operations against ISIS. At a press conference in Ankara, Foreign Ministry Tanju Bilgiç said that joint operations were to begin in the near future. "Once the targets are determined, the required intelligence must be made, which will then be followed by an operation. Turkey and the U.S. have announced their agreement on the technical details, thus it is obvious for all to expect joint airstrikes to begin in the near future," Bilgiç had said. Additionally to Bilgiç's statements on Thursday, Foreign Minister Mevlüt Çavuşoğlu said there are no contradictions between Turkey and the U.S., and "how the joint operations will be realized is a matter for the military and its related institutions." The agreement between Turkey and the U.S., in part, allows the latter to conduct manned and unmanned flights out of the Incirlik Air Base in southern Turkey, and for Turkish jets to conduct airstrikes against ISIS. Turkey last month conducted solo airstrikes against ISIS targets inside Syria but the agreement with the U.S. has set a common targeting process that integrates Turkish jets into the coalition force.